Large Phi Beta Kappa Ring is available in ring sizes 8, 9, 10, and 11. The Phi Beta Kappa insignia is engraved on the top. Each ring comes packaged in a beautiful black velvet box. Rings are available only in 10 karat gold. Rings are engraved with the member's initials and year of election. Ring half-sizes are available for an extra fee. The Small Phi Beta Kappa Ring is available in ring sizes 4, 5, 6, and 7. 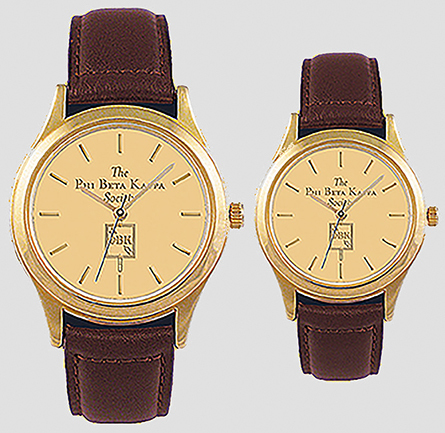 The Phi Beta Kappa insignia is engraved on the top. Each ring comes packaged in a beautiful black velvet box. Rings are available only in 10 karat gold. Rings are engraved with the member's initials and year of election. Ring half-sizes are available for an extra fee. Custom Ring sizes between size 3 to size 8 for small rings and size 7 to size 12 for large rings, including half sizes are available for an extra charge. Signet rings in two styles (large and small) are available with the Phi Beta Kappa insignia engraved on the top. The large style is made in sizes 8, 9, 10 and 11. The small style is made in sizes 4, 5, 6 and 7. Custom half-sizes are available for an extra fee. Please enter custom ring size on the Personalization page and order custom half size above. Rings are available only in 10 karat gold. Rings are engraved with the member's initials and year of election. It is important that each ring be sized correctly. You may call Hand & Hammer for extra assistance with ring sizes. Personalized items are not returnable. Orders can usually be shipped within three weeks of receipt and verification of membership.